This post is the continuation of the Part 1 of the experience. To read Part 1 please click here. This was probably the easiest stretch of the trek. We had an estimated time of 3 hours to cover about 5 kms. We had a couple of problems before starting off from Behali. Firstly, one of the participant Ananth had his shoe sole come off. In spite of inquiring around, we couldn’t find an extra pair of shoes for him. So, he just performed a temporary hack by using some glue and rope. The second issue was another participant Prateek fell ill and had high fever. He consumed a lot of paracetamol to help him trek for the remaining journey. After we left Behali, we got to see some glacial left overs on the way. This was our first encounter with ice. After trekking for about two hours upwards, we reached a flat land where we halted for lunch. We were running well ahead of schedule and hence, decided to take a break of atleast 2.5 hours. One particular sport unites everyone in India. And that is the game of cricket. We managed to get a bat and a ball from a local there. The flat land also had a stretch of grass removed. Using that as the pitch, we started playing cricket there. For most of us, it was the highest point at which we have played this game. After playing about 5-6 matches of gully cricket, we were quite satisfied and hence, got the enthusiasm to move ahead. After about another half hour of trek upwards, we reached the much awaited camp site at Waching. This site was again on a completely sloping land. This was also the first campsite where we had no pre-built toilets. Although women still had a pre-built toilet spot, for men it was answering nature’s call in nature’s style. Since, the entire area was on sloping lands, one had to perform a mini-trek to even find a good spot to answer the call. This added to the beauty of this campsite. The other distinctive feature of this campsite was that, at this spot we were completely surrounded by snow-capped mountains on all the sides. A view outside the tent looked like the picture below. This naturally meant that the nights became extremely cold. One needed to wear gloves and scarf to keep one completely warm. Since, we had an extremely easy trek for the day, everyone had full energy to perform camp fire. We all got together and sang a lot of famous hindi songs. This was also the point where a bit of thrill started creeping in. We were told that the next two days were the most tiring parts of the trek. Also, it would be the days where we would be encountering snow and hail storm. With a hope of enjoying ourselves fully, we went to bed that day night. The next day morning, Ananth found an extra pair of boots in the camp leader’s tent. With his permission, he took that and now all the equipment related issues seemed to be resolved. But, illness never seemed to stop spreading. The next morning, another girl Preeti also fell ill with high fever. 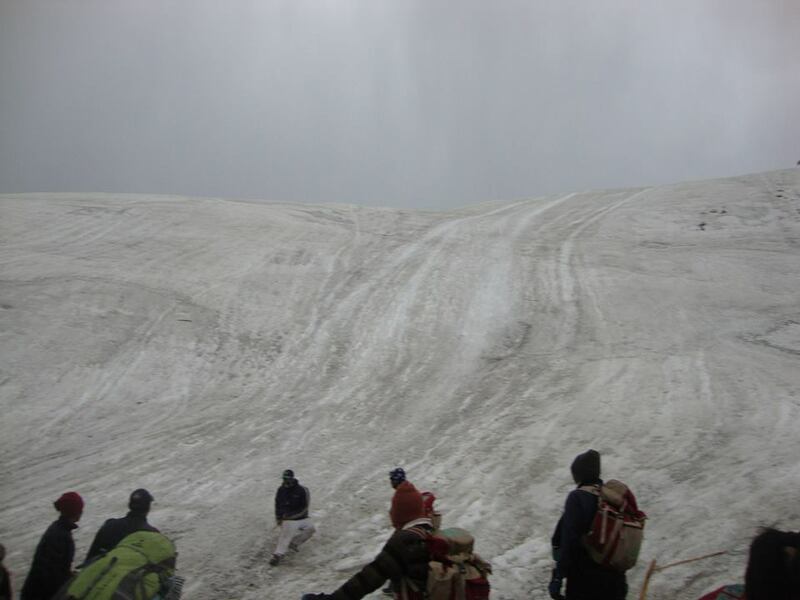 Hence, two people in the group had to do the tougher parts of the trek with fever and cold. But, the motivation in the group was strong that, they eventually completed the trek without giving up. As we were told, moving from Waching to Nagroni was the start of the tougher parts of the trek. 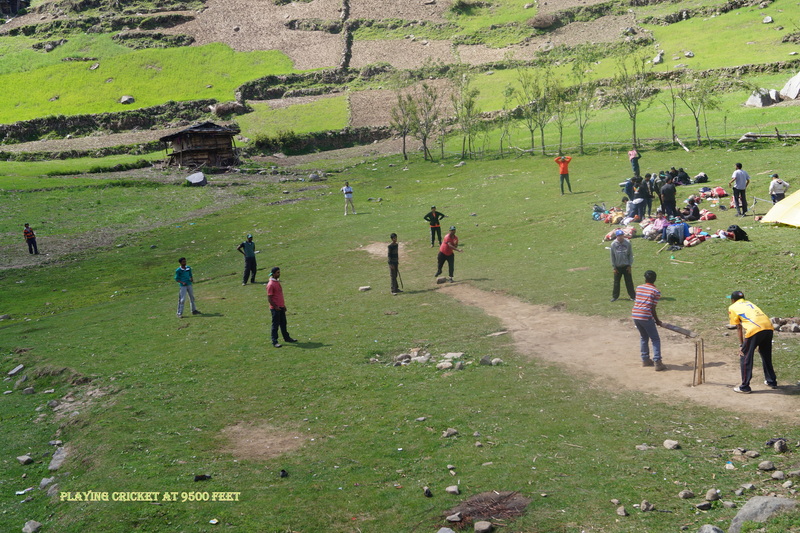 In the words of Mr. Chauhan, it was the “semi-finals” of our trek. The hype created by him was aptly justified since major part of the day’s trek was climbing steep slopes. This drained out our energy very quickly. Also, at some spots in the the journey there was ice patches. This was exciting for most of us since that was what we had been hoping throughout the trek. Fortunately for us, the weather had been good so far in the trek. Apparently, for some groups which came before us, the waching campsite was completely immersed in snow and the entire path from there on was a path on snow. Thankfully for us, we just encountered patches of ice, while the majority of the path was grass and sand. It took us a complete 6 hours to finish about 3.5 km of trek for the day. This was mainly due to the steep slope on which we were making the climb. After huffing and puffing, by about 4 PM in the afternoon, we reached the highest campsite of our trek - Nagroni campsite. 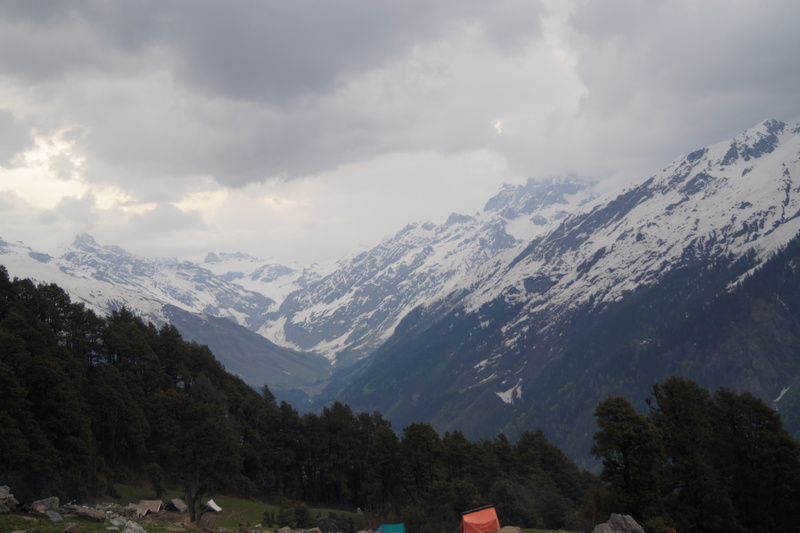 This campsite was situated at about 10,000 ft and was completely surrounded by majestic Himalayan ranges. The view from this campsite was picturesque. The sheer beauty of the scenery around and the sight of snow-capped mountains nearby pumped up the enthusiasm in all of us. We had an early dinner and an early camp fire, since we had to leave early the next day morning. We were asked to get up by 3 AM and be ready to leave for the next day’s trek by 5 AM. So, by about 7:30 PM we winded up our camp fire(which turned out to be a game of dumb charades) and went into our tents. Almost everyone was waiting for the next day to come. It was the day when we would cross the Chandrakhani pass. And in words of Mr. Chauhan, it was our “finals”. By about 5:30 AM all of us assembled, performed the customary head count and left for the day’s trek. The day’s schedule was an hectic one. We were to trek for about 17km through snow and it was estimated to take us till evening 6 PM to complete the trek. With high hopes and immense motivation we started off our journey towards the Chandrakhani pass. Within about half hour of the journey, it started raining heavily making the rocks and the path quite slippery. Soon about an hour later, we hit the first fully snow covered path in the journey. From there on, it was just snow-snow everywhere. The paths turned to be tricky and adverse. With rain continuously pouring down, it made the paths more and more slippery. At some spots, the ice just caved in. In one of the points, I ended up going knee down into ice, since the layer just caved in. This was an awesome experience. The road winded and and upward slope was quite steep. With help from each other, we slowly made our journey upwards. 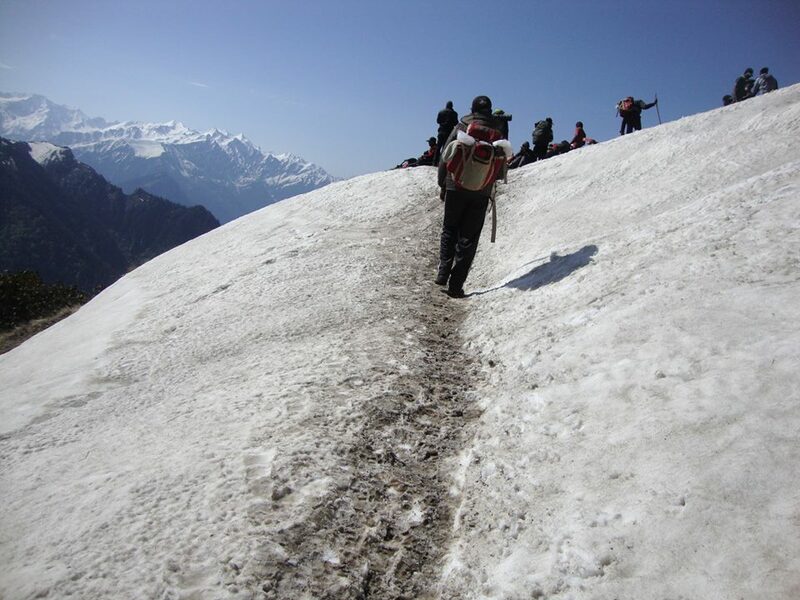 At one point along this path, there was slippery mud and snow through which we had to make our trek. I had a momentary slip at this point and by far that was the most scariest moment. With the support of a nearby rock, I gained back my posture and I continued the trek ahead. At this point, the rain had already taken the form of snow and hail-storm. It was the first time I had experience soft pieces of ice falling down on my shoulders. After about another half hour of steep ascent we reached the entrance of Chandrakhani pass. Yet another thrilling experience was awaiting us here. There was strong cross winds blowing across since we had reached the top-most point. There was a narrow path of snow on the sloping edge of the mountain. We had the support of a rope for the first 30m or so, beyond which one had to use hands to catch the sloping side of the mountain and walk ahead. The non-mountain side of the path sloped down towards foothills at about 6000ft. Hence, a small slip meant we would go rolling down the slope. This was the moment where we had immense adrenaline rush. We slowly clamped onto the ice with one hand and moved ahead on the narrow path of ice. We had to make a complete circle around the Chandrakhani pass in this manner. The scenes at this point were something which is not describable in any amount of words. And since the trek at this point was quite hard, it was almost impossible to take a picture of this spot. The 10 or so minutes crossing this path was a feeling which made the 5 days of climb, worth the effort. Since one had to touch snow continuously for about ten minutes, lack of gloves only meant one thing - frost bite. One of the group members Irfan, unfortunately didn’t wear enough protective clothing while crossing the path. Midway through, his hand and legs went numb and he started getting symptoms of Hypothermia. Thankfully, one of the Sherpa noticed it and immediately carried him to the nearest flat spot. He then gave first-aid treatment in the form of transferring body heat. And later, took him downwards towards base camp where the temperatures were comparatively higher. This incident momentarily disturbed some of us since we had never seen such a body condition before. Once past the pass, the journey now was downhill. We had to walk long distances on ice on flat land and get to an appropriate spot where we could do ice sliding. Ice sliding is a method to descend through ice mountains at a quick pace. It is extremely fun activity and the best part is that doing it wrong will not cause any kind of injury. We walked for about 2 km on ice before we halted for lunch. After lunch, we experienced the longest slide of the trek. This was everyone’s first slide and almost everybody made a mistake. Hence, the postures the body went into while sliding and while halting were extremely funny and we all had a good laugh seeing others slide. The first slide was the biggest of them all. In the photograph below, we started the slide from a part above the topmost visible point and slid down all the way till where people are standing. Ice sliding re-energized everyone again. Till before this, almost everyone was tired of the ice. The snow started getting into my boots and hence, made my socks wet. I had three pairs of socks on me and the snow managed to get all of them wet. After about 4 such slides at various points, and long walks through flat ice, we could see a canteen in our sight. The frustrating part about walking on ice was that every time you walk normally as you would walk on normal land, you would slip and fall. You needed to groove your feet strongly in ice before taking the next step. Hence, it consumed almost thrice as much energy as walking on normal land. And all the slipping down and falling started to get frustrating after a certain point. It was like a new-born baby learning to walk. Once, we reached the canteen, we were invited with hot maggi, omlette and tea. It was extremely comforting and soothing for the body. We still had about 2 hours of trek remaining for the day from that point. Hence, the break was extremely essential. After the canteen, we continued our journey ahead. This time there were patches of normal land in between snow and this gave indication of descent. We got the opportunity to perform 2 more ice sliding. Since, we were now accustomed to this act, the sherpas made us go in groups of three to speed things up. By about 6:30, we reached our campsite for the night, the Nau Tapru campsite. After walking through the ice for the entire day, this camp felt like heaven. There was no ice and we were feeling slightly warm! Not a single person had any energy left in him to conduct camp fire. We quickly had our dinner, put our clothes to dry and went off to sleep. This was the last day of the trek and we had already achieved the main purpose - going through the Chandrakhani Pass. It was now time for descending back to base camp. 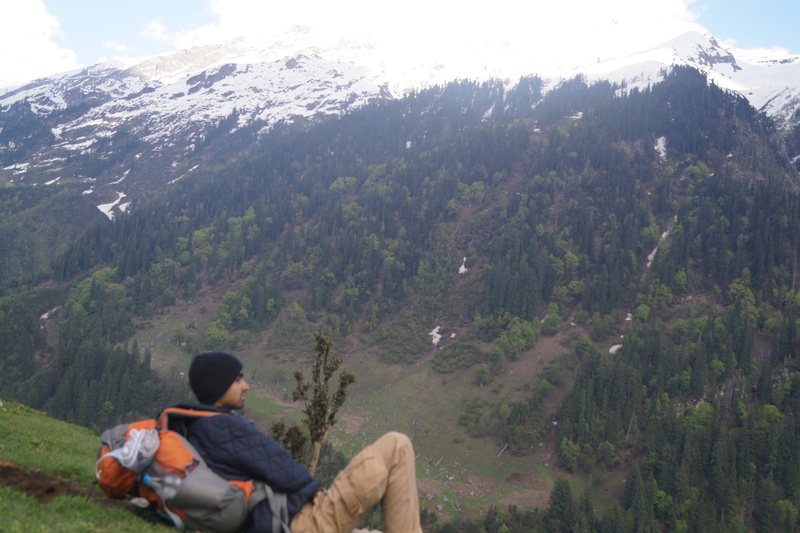 This happened in two phases- First descend on foot till Naggar, HP. And then take a car/bus from there to the base camp near Kullu, HP. The first phase was not as hard the previous day’s trek, but challenging nonetheless. The descent was extremely steep. The path was a mixture of grassland and rocks which made the descent comfortable on the legs. But, the sheer distance and tiredness from the entire trek so far made all of us just want to get back to flat land. I was tired of standing on sloping terrain and wanted to give some comfort to my knees and back by walking on plain lands. The descent by foot was for about 3.5 hours. We had frequent breaks in between. We kept chatting about random stuff and cracking jokes along the way. The one good thing about this trek was that we made a lot of good friends during the process. Everyone shared the same frustration and pain and this helped in getting people closer. The camp fires every night also bridged the gap between us and we were now quite close to each other. After about 3.5 hours, we came in sight with civilized life. We hired cars to SeoBagh and in batches of about 10 left towards the camp. The journey was for about 2 hours and when we finally reached the spot we were familiar with we screamed our guts out. We had finally completed the trek successfully and were back to place where we had electricity and sheltered toilets ! 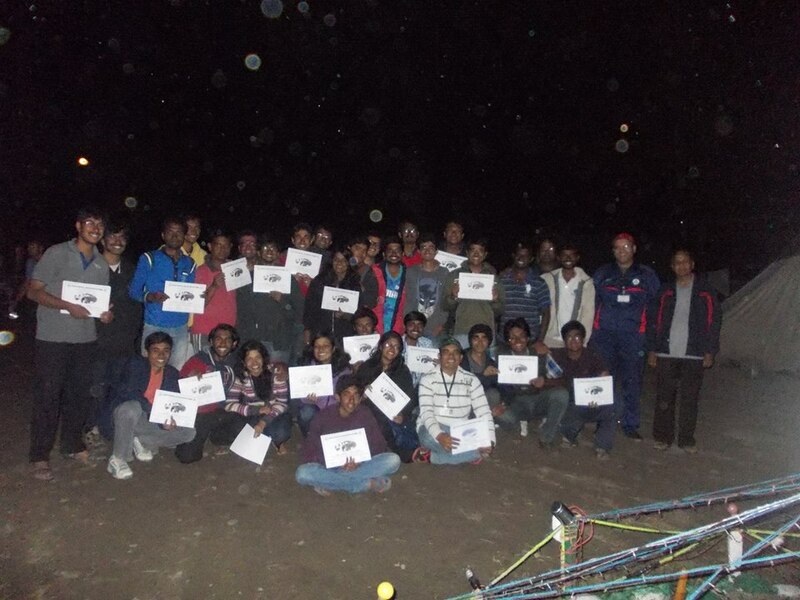 During the night’s camp fire we were invited individually and were given a certificate of completion by Mr. Chauhan. Our group of 19 had booked bus for 10PM the same night. So soon after camp fire, we took one last group photo. We then exchanged goodbyes and left the base camp towards Delhi. The trek had helped us make a lot of new friends and bidding good bye so soon seemed a difficult task. Since we were among the first ones to leave, the remaining people gave us a grand send off which made us miss the place even more ! I would like to thank Abhishek, Sachin, Surya and Vishal for the photographs used in this post. 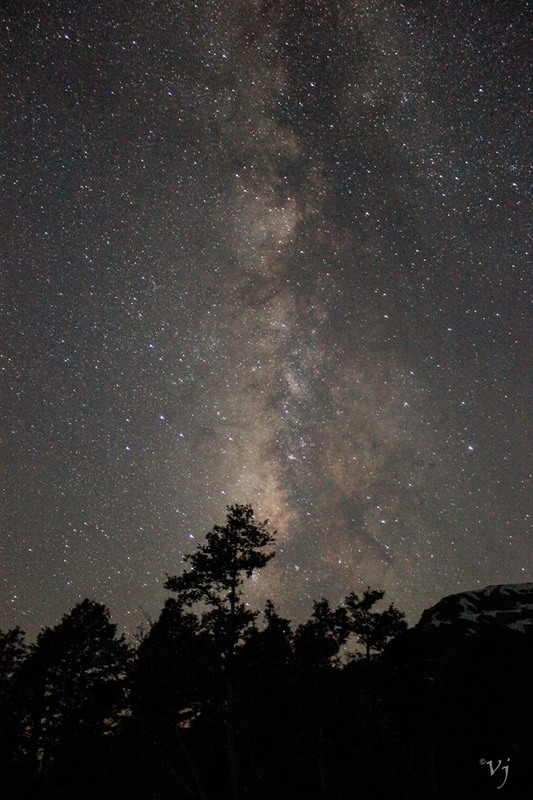 I would also like to thank Mr. Vijai Kanth Panthayil from group CP-29 for the special photograph of the Milky Galaxy.